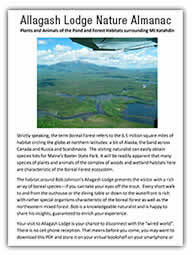 Fishing around Johnson's Allagash lodge is unique for a number of reasons. While our home pond flows to Allagash lake, and down the river, some of the neighboring bodies of water are the headwaters of the Penobscot and St. John rivers. Of the twenty lakes and ponds that we fish within a ten mile radius of our lodge, our 150 acre front yard is the most productive, routinely producing squaretails in the 12-16 class. Narrow Pond is one of 216 bodies of water in the state that has never been stocked. Along with still water fishing, we fish streams from ten to sixty minutes from our back door, that hold brookies, landlocked salmon, and one river that has great musky numbers that will come to a fly. 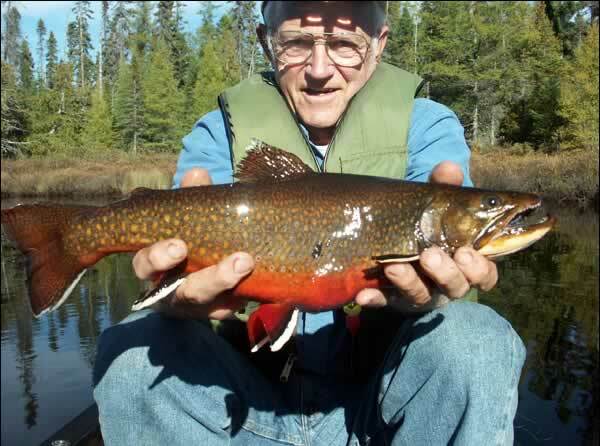 Because wild Brook Trout are extremely sensitive to handling, Catch and Release is routine when fishing with Bob. While the vast majority swim away unhurt it is not uncommon that a fish or two are lost to accidental gill damage, and these are recovered and can be enjoyed at the table. 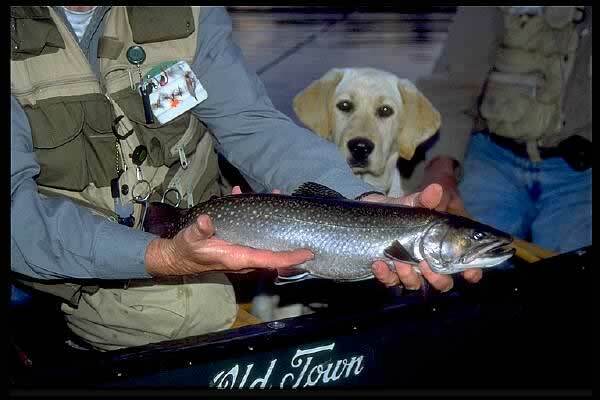 Fly fishing in the northern Maine woods varies greatly, but for most brook trout and landlocked salmon, mid weight, [5-6 weight] gear will probably work best. New guests are usually surprised to learn that we spend quite a lot of time fishing from canoes or the wooden boat on our home lake [pond]. While we do stash canoes on a handful of more remote ponds, many waters are accessible by 4wd vehicle and allow for relatively easy carry in. Opportunities for dry and wet fly fishing are about equal, depending on the season, and priorities of each fisher person are always taken into account. Often times, the largest trout are taken on sub-surface flies, but come hard, while during the same time, great action can be had on top for smaller fish. Skill level may also play a hand in determining what water to fish, as very technical fishing isn't for everyone. Throwing woolly buggers, nymphs, or streamers, attached to a weighted line is sometimes the advised method for hooking "Walter", but chances abound for dry fly action. Many an evening supply the day's best fishing, as we chase and cast long to evening cruisers in our "front yard". During mid summer, the majority of your time, may include attempting perfect [maybe good] presentations of mid size dries to spring hole brookies. Matching the first hatch of the season, will probably mean blue wing olives, and then nearly two months later, the Hexes, begin. Caddis flies of all colors and sizes hatch all summer, and are particularly prolific on our salmon stream, and the Allagash river itself. Some favorite caddis patterns are tent wings, goddard, and stimulators. The St. John river Muskie fishery is very alive and well, and more and more guests show interest in battling one with a fly rod. The St. John is a wide, rocky, and generally shallow river, and hooking and fighting a muskie while wading is a real hoot. The term "Fish of a thousand casts"wasn't forged here!